The Rocks are gunning for a play-off place to round off their best season in years. Their FA Trophy adventure ended at Grimsby on Saturday as they pushed one of the top non-league sides all the way before losing 3-1 on aggregate. Management, players and fans are still reflecting with great pride on what was easily the club’s best-ever run in the competition, which saw five teams from higher divisions beaten along the way. 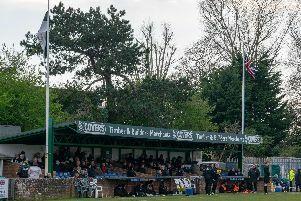 Now all parties are hoping they can continue their fine league form and end the campaign in the top five to earn a play-off spot and a stab at promotion to National League South. They boosted those hopes with a 2-1 win at Harrow on Tuesday and their hectic schedule continues tonight (Thurs 24) at home to Grays. That starts a run of 12 games in 31 days that will test the squad to the full, but boss Jamie Howell said they were determined not to let the season peter out. When I stood there with the players and fans after the end of the game at Grimsby, I was very, very emotional. It was one of my proudest moments. And he agreed a play-off place would be a fitting reward for the effort players and fans had put in. Howell and coach Darin Killpartrick said they were proud of the players and fans for the way the club had been put on the national football map in the remarkable FA Trophy run. Injuries could affect the run-in and they have already lost right-back Calvin Davies, a star of recent games. He is out for the season with a broken metatarsal picked up at Grimsby. But Harvey Whyte is fit again to slot into his place and Brighton loanees Chike Kandi and Connor Tighe are on their way back after knocks. Midfielder Doug Tuck will be eligible for the two Easter games – Saturday’s visit to Needham Market and Monday’s home game with Burgess Hill (3pm) – after a three-match ban. Howell said: “It’s been our best season for a long time, certainly my best as a manager, and if we were to end up with nothing, it wouldn’t be a fair reflection on the players. “We will keep going and see where we end up in the league. “But what I would say is it is easier playing three games a week when you’re winning. It gives you extra energy. “The fans have been superb for us through this run and it would be great to get to the play-offs for them and for the club. Howell said he hoped the Trophy run would have a lasting legacy. “It’s lifted everyone and caught the imagination of the town. Killpartrick praised the unstinting efforts of the squad in pushing Grimsby all the way then winning 2-1 at Harrow on Tuesday. “These lads are not full-time footballers – they have day jobs too and are fitting in all this football as an extra. They’ve been magnificent. “When I stood there with the players and fans after the end of the game at Grimsby, I was very, very emotional. It was one of my proudest moments. See pictures and video from the trip to Grimsby on this website – and don’t miss today’s Bognor Observer for reports from the Grimsby and Harrow games. Share with your family and friends so they don’t miss out.